It so daunting. So nerve-wracking. The awkward hellos, flamboyant bios, feigned interest and fake smiles. Networking is overwhelming due to the silly pressure we put on ourselves to be fabulous and interesting. But you know what? Done right, it works. Every time. We naturally network on a daily basis. We seek a referral for a good doctor or a real estate agent from a colleague. We ask our neighbor for a great restaurant or movie recommendation. Why can’t this easy flow of helping each other work in the job market, too? Authenticity is the key to connecting and resonating with people. If you’re a bit nervous, share that. The other person will likely put you at ease or share their discomfort as well. Ensure your appearance matches the way you really feel and wish to be perceived—professional, comfortable, stylish. Either way, it needs to look and feel truly “you.” Be proud to share who you are. If you’re attending an event for a professional association, a local chamber of commerce or even a neighborhood barbecue, understand who your audience is and why they are there. This creates your first level of commonality and topics for discussion. Research the event’s speaker or history of the organization so you have interesting items to share to further the discussion. The art of conversation is to truly listen. Don’t speak over someone excitedly. Listen attentively and patiently. But, do so in an engaged manner—with great eye contact, open body language, letting your body and face show that you “hear” them. Have a few questions ready to start a conversation, or when someone is sharing with you, further the conversation with questions you ask. This shows you care about what they’re saying and builds a connection. Thank the person you’re speaking with for the conversation. Ask for permission to reach out to them in the future for further discussion or recommendations. Then send them a handwritten thank you note, which will create a personable, lasting impression. Share why you can help each other. Networking isn’t a competition to outshine everyone in the room. It’s an opportunity to meet someone new and see how you can help each other. If you bulldoze an event with personality and forced charm, you fragment the energy in the room and do yourself a disservice. However, if you approach networking with energy, enthusiasm and exude a genuine sense of caring about the other person, you’ll have made a new friend and contact. 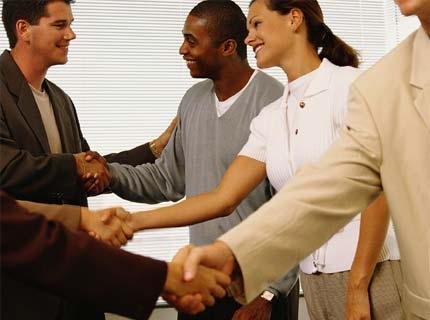 Networking is good manners, good conversation and a helping hand—which always works. What do you find the hardest part of networking? Share your thoughts with us in the comments!